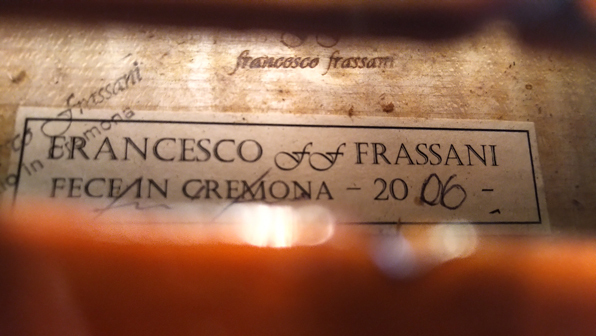 This good sounding Italian violin from Cremona bears Frassani's original label and brandstamps. It is of relatively simple make but its surpring, outstanding tone clearly conveys this spirit, an example of the way in which Italian luthiers uncompromisingly focussed on sound. Their approach is evident in the exceptionally delicate moulding and carving of the top and back. Without any repairs this attractive contemporary Cremonese violin has been maintained in very good condition. There are slight touch-ups on the dark and luminous red oil varnish. The warm sound is nuanced and expressive, which is full of warm power and good resonance. The violin makers at our atelier have spared no expense in setting up this recommendable 2006 contemporary Italian instrument down to the best playing standards. It is now ready to play, and we especially recommend it for demanding musicians. A handmade instrument that is quite reasonably priced, the origonal maker's certificate is included in the price.